Patrick McGinley (Ireland, 1995) began his studies when he first began piano lessons at the age of 6 and has received a Grade 8 Honours Certificate from the Royal Irish Academy of Music. From a young age, he sang in the local church choir with his father and at the age of 14 joined the Moville Gospel Choir. A year later he joined the choir band, playing the piano and acting as band director. 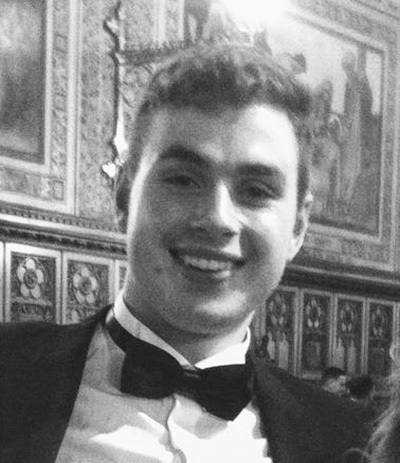 He joined the Maynooth University Chamber Choir in 2013 and travelled with them to compete in the Canta en Primavera Festival in Malaga, Spain in March 2014, winning two gold diplomas. In 2015, he took part in the choir’s first album and following the choir’s success in winning the Choir of the World trophy at the Llangollen Eisteddfod, he toured the United States and China for 21 days in March 2016. Patrick is a member of the Irish ensemble Anúna, directed by composer Michael McGlynn, and with them has toured the Netherlands and Belgium and performed in the National Concert Hall of Ireland and University Concert Hall Limerick, including performing solos. He has also performed in Elgar’s The Dream of Gerontius, Verdi’s Messa di Requiem, and Patrick Cassidy’s Children of Lir.